Onions, garlic, chives, and leeks may be the basis of many culinary masterpieces. but today’s Pet Poison Prevention Week article explains why this “fearsome foursome” is bad news for cats and dogs. 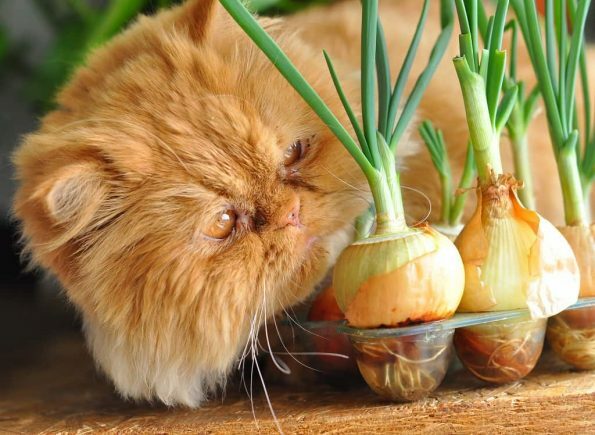 Onions, garlic, chives, and leeks are in the Allium family, and are poisonous to both dogs and cats if the dose is right (if they eat a single large serving or repeatedly nibble on small amounts over time). Garlic is considered to be about five times as toxic as onions for cats and dogs. Certain breeds and species seem to be more sensitive, particularly those of Japanese descent (e.g., Akita or Shiba Inu). Onion and garlic poisoning results in gastroenteritis (e.g., nausea, oral irritation, drooling, abdominal pain, vomiting, diarrhea), and more seriously, oxidative damage to the red blood cells that causes them to rupture. Red blood cells carry oxygen around the body, so their destruction leads to symptoms of anemia, including lethargy, pale gums, an elevated heart rate, an increased respiratory rate, weakness, exercise intolerance, collapse, and even death. Alliums also relax heart muscles and dilate blood vessels causing circulatory problems and low blood pressure. This leads to weakness and further impedes the delivery of oxygen to vital organs. Moreover, chemicals derived from some of these plants diminish the ability of the blood to clot. Onion and garlic poisoning may have a delayed onset, and clinical signs may not be apparent for several days. While minute amounts of these foods in some pets, especially dogs, may be safe, large ingestions can be very toxic. If you suspect that your cat or dog has eaten one of these plants, call your veterinarian (or the nearest emergency vet clinic) right away. If the ingestion was recent, your veterinarian may be able to induce vomiting to remove undigested herbs from your pet’s GI tract; however, you should not induce vomiting at home without consulting your pet’s doctor. Your veterinarian may also administer activated charcoal to decontaminate the GI tract. These tactics serve to prevent the toxin from taking hold in the body. If the toxin has already begun its dirty work, your pet may require supportive care in the form of IV fluids and medications to alleviate GI symptoms. If the anemia is severe, he or she may require a blood transfusion and oxygen therapy to protect organ function. Hospitalization and lengthy monitoring may be required because the worst stage of anemia usually occurs several days after consumption. How can poisoning be prevented? It’s important to note that any form of these vegetables can be toxic. Dried, powdered, liquid, cooked or raw herbs are all poisonous to your dog. Another dangerous source of these toxic plants is human nutritional supplements, which are concentrated, and may look like a treat if a pill is accidentally dropped on the floor.